TUCSON, AZ (Tucson News Now) - It's the new way of doing drugs and it's gaining in popularity. It's so discreet, your teen could be doing it right under your nose and you may not have a clue. Some teens are choosing to vape marijuana and for the first time, we know how many are doing it. What we can't tell you is what exactly it's doing to their bodies. David Terry, 24, said he vapes marijuana. He has his medical marijuana card but admitted he started out smoking recreationally when he was a teen. "Back in the day it was like go home down the street, smoke a joint and walk into your mom's house and your mom's like '(expletive) it you smell like weed! Get the (expletive) out of my house,'" Terry said. Now, he said it's a whole new world. "They just vape their pens real quick and go inside mom's house," he said. Terry said teens could do it in their bedroom and their parents wouldn't have any idea. That's because vaping doesn't have a strong smell. "I use wax, so this will smell but the actual oils, they're really discreet," he said. He said vaping pens are also easy to hide. Those are two big reasons he thinks so many teens do it. A new study claims one in 10 high school seniors vaped marijuana in 2017. You can read more about the study HERE and look at its results HERE. It is the first national study of its kind to track teens vaping the drug. Smoking or vaping cannabis may give the user a lot of the same effects. However, the products themselves are very different. Brian Warde is the CEO of The Prime Leaf in Tucson. While he deals with medical marijuana, he said he's an expert on what's in the oils, waxes and other products. "To make that a vaporizable product, they have to usually add additives," he said. "The most common additives that were (used) in the very beginning are petroleum based." He said some prefer to stay away from additives like butane and vaporize the flower itself. Warde said the products he has in his medical cannabis shop aren't necessarily anything like what you'll find on the streets. "Streets you don't even know," Terry said. "You just buy the weed. You know it's going to get you stoned." But what does vaping marijuana do to the body and is it safer than smoking it? Dr. Emil Annabi of the Pima Pain Center said we won't know for decades. "Vaping is in its infancy and we don't have any long-term studies that show is it really safe," Annabi said. "We're probably not going to know until another 10, 20, 30 years." Another medical concern is dabbing. 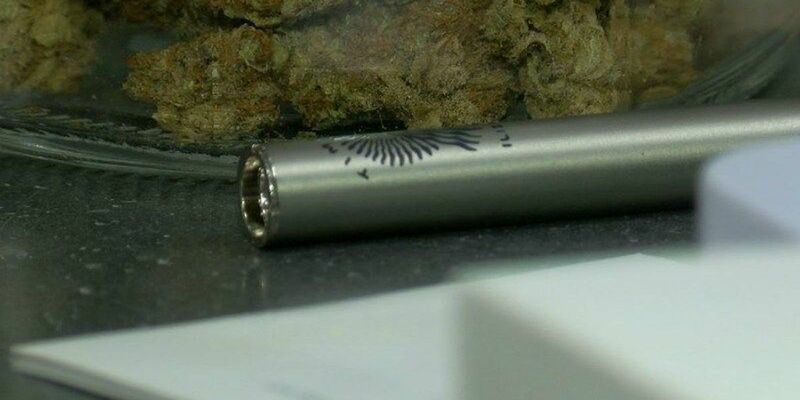 With dab pens, teens vaporize highly concentrated marijuana. "It wasn't really known that you could overdose on marijuana, but that's not the case with dabbing and the reason why is basically because it's a home experiment," Annabi said. "People pass out. There have been reports of people getting skull fractures and losing their teeth." When it comes to marijuana, Annabi stresses medical and recreational are two totally different things. When it comes to your teen vaping, he's concerned about possible future health issues we haven't yet discovered. He said he offers the advice to all teens -- don't do it. Annabi said if you haven't yet, you should talk to your teen about vaping marijuana now. He said if you don't, their friends likely will.